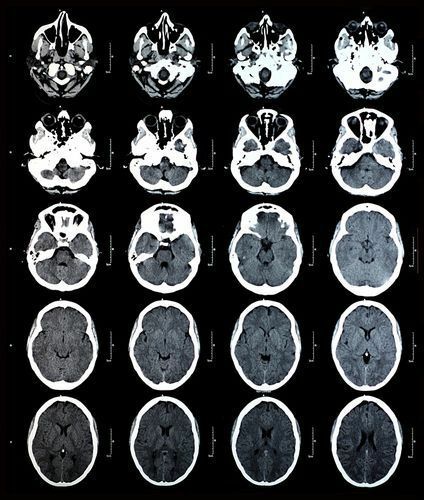 How Can a CT or CAT Scan Be Used to Diagnose My Brain Injury? CT scans are the most commonly used imaging tests. They are a series of X-ray images taken one slice at a time and combined to form images more detailed than a traditional X-ray. They are invaluable in the diagnoses of acute and life threatening problems and often used in emergency rooms when someone arrives with a head injury. They are superior to MRIs for viewing changes in the structure of the brain such as hemorrhages, lesions, subdural hematomas, and temporal bone, skull and face fractures. However, they can miss signs of Traumatic Brain Injury (TBI) for various reasons. The findings on CT scans sometimes lag behind the actual injury if the test is performed too soon after the trauma, leading doctors to underestimate the extent of the injury. Damaged axons, which manage the transfer of information within the brain, are microscopic in size but the CT scanner doesn’t reproduce microscopic details so they often go unseen. CTs can also miss small amounts of blood because the images are taken one slice at a time and later combined. If a blood pool or other abnormality is smaller than the width of a slice, 5 to 10 mm generally, it may not show up on the images. I recently learned of a case where a brain bleed was not discovered until months after the accident even though the patient had a CT of the brain done immediately. It went undetected until the bleeding had gotten severe enough to affect that person’s balance and required a follow up scan. Even though CT scans miss certain things, they remain the prominent choice of doctors for immediate diagnosis and treatment of brain injuries for their quickness and accuracy in detecting life threatening conditions. A CT scan only takes about 15 minutes (or 30 minutes if contrast is used) to complete the test and be of use for doctors. For someone suffering from a stroke or aneurysm where time is crucial, the CT is a life saver. The story changes two to three days after trauma when MRI becomes more accurate at detecting slight abnormalities in the brain than CT scans. As blood ages it becomes denser and can look more like tissue on a CT. MRI scanners do not rely on density, but instead on magnetic charges and radio waves, so the changing composition of the blood does not impair the results. When looking at the results of a CT scan you will see a grayscale image of the brain. The lighter in color something is, the denser the tissue, fluid or bone is. So, your skull will show up as white and the brain tissue will show up as different shades of gray with any gas or air appearing the darkest. Doctors use these shades to determine which areas are ‘not normal,’ such as a lesion, fluid, air or another mass in the brain instead of standard brain matter. CT scans are undeniably vital in the diagnoses of potentially lethal injuries. They exist to rule out and diagnose problems that need to be treated immediately. Keep in mind, a ‘negative’ or ‘normal’ CT scan does not conclusively mean there is no brain damage, particularly when the patient has suffered a concussion or loss of consciousness. It is crucial that caregivers and patients carefully monitor and report any physical signs of brain injury (memory loss, balance issues, confusion, etc.) to a physician for a follow-up examination. It's important to note, to have a legitimate medical malpractice claim, your surgeon or doctor had to have been grossly negligent. This means they had to have completely misread or ignored the fundamental findings of your CT scan. I Had A Serious Concussion But The MRI Came Back Negative. What Does this Mean? The results of an MRI, or Magnetic Resonance Imaging test, while very thorough, don't show every injury in the brain. A ‘normal’ result cannot single-handedly rule out brain trauma. In some instances, the MRI test may have been performed too soon. The effects of serious concussions are not always immediately apparent. For example, if you have a slow bleed in the brain after an injury, but were given an MRI right away, there may not have been enough blood to cause concern in your results at the time of the test. A follow up MRI taken days or weeks later may show a totally different brain. In other cases, the MRI doesn’t have the power to see the injuries. The standard MRI scanners used in most ERs can detect blood and lesions as small as 1 millimeter. That sounds really small, but the brain has a lot of even smaller parts. Persons with diffuse axonal injuries often don’t show any indicators of brain injury on an MRI test because the axons in the brain are so tiny (one thousand times smaller than a millimeter) the tests can’t even detect them. The brains of people with Alzheimer’s, Dementia, Schizophrenia, and Parkinson ’s disease would all appear to be normal based on MRI or CT imaging, but we can all agree there is something wrong in those brains. Simply put, a negative MRI does not mean you don’t have any brain damage. If you are experiencing symptoms of a serious concussion or brain injury after an accident, speak to your doctor about your concerns. Please note, to have a legitimate medical malpractice claim, your surgeon or doctor had to have been grossly negligent, completely misreading your MRI. Have you suffered a serious brain injury? You need to speak with an experienced personal injury attorney. Jim Dodson Law is here to help. Contact us online or call us directly at 888.815.6398. We will be happy to answer any questions during your free consultation. Does the 3-Foot Rule Apply to Other Bicycle Riders Passing Other Cyclists? Jim Wheeler from the Sarasota Manatee Bike Club called me a week or so ago and had a question. He had been riding with his weekly group when they were passed by another group of riders. His concern was the passing riders did not announce their approach and passed, in his view, dangerously close to them. His question was whether the “3 foot” rule applied to riders. My answer may surprise you. Let’s start by looking at the statute language that applies. First, Fla Stat 316.003 defines a “driver” as any person who drives… a vehicle. A “vehicle” is defined as every device in, upon or by which any person or property is or may be transported… upon a highway. A “highway” is virtually every way open for vehicle traffic. A “bicycle” includes every vehicle propelled solely by human power. This means a bicycle is a vehicle. I was Hit By a Car on My Bicycle. Will I Have to Pay Out of Pocket for My Medical Bills? If you are hit by a car in Florida while riding your bicycle, your medical bills will be covered by No-Fault Insurance, also known as Personal Injury Protection or PIP. In Florida, PIP pays up to $10,000 in medical bills. This coverage will come from the policy you carried on your own car or from a policy carried by a family member with whom you resided on the date of the accident. If neither you nor a family member owned a car, then you would be covered under the PIP coverage on the car that hit you. We get calls from injured cyclists who have PIP on their own auto policy, but who are concerned because they carry a deductible of $500 or $1,000. If you carry a deductible on your PIP coverage, your insurance company will deduct the amount of the deductible against the medical bills they receive for payment under the policy. This means if there is a $500 deductible, you will have to pay the first $500 in medical bills. You are still entitled to the full $10,000 in PIP benefits, but the first $500 will be your responsibility. There are several ways to handle a deductible so you will not have to write a check to the doctor or hospital. Feel free to call us to talk about your concerns and how we can help. If I Hire You as My Lawyer for My Bicycle Accident, Will It Cost Me Money Up Front? Are There Any Hidden Lawyer Fees? How Do I Pay Your Legal Fees? What Cities in Florida Do You Handle Bicycle Accident Cases? I handle cases all over the State of Florida. My main office is in Clearwater, but I have multiple satellite offices along the Gulf Coast and in Central Florida. I will come to you when it’s needed. Why is It Important to Hire an Experienced Cycling Accident Lawyer? A former client told me he felt it was the best decision to hire a cycling lawyer because “you’re one of us, you see the world through my eyes.” Only a cyclist understands how and where cyclists ride, what damage to a carbon frame means, and what it means when you’re unable to ride like you had before being injured in a crash. As a cycling lawyer, I’m in the best position to make an insurance adjuster or a jury understand the consequences suffered by an injured rider. I understand traffic laws that affect cycling; many of these laws are misunderstood by claims adjusters as well as the police. Do I Have to Come to Your Office to Discuss My Cycling Accident Case? Will My Bicycle Accident Case Take Up A Lot of My Time? How Long Does it Take to Settle a Bicycle Accident Claim? Will I have to Go to Trial for My Florida Cycling Accident Case? Probably not; the vast majority of cases are settled without a trial. It is important, however, for the insurance company to believe your lawyer is willing to try your case, if necessary. It keeps them honest. Yet, each client makes the decision whether to accept a settlement or take their case to trial. If We Meet at My House to Discuss My Cycling Accident Case, Who will Come? If we decide to have a meeting at your home, I would usually come alone. I may bring along a legal clerk or paralegal to help with document sharing and note-taking so I can have a one-on-one discussion with you. I will never bring a stranger into your home. In What Areas of Florida Do You Handle Bicycle Accident Cases? It isn’t necessary to come to our office. Many clients do and many clients do not. When necessary, I will come to you. Some clients like to drop in with documents they receive because they live close to the office whereas other clients may live out of the area and prefer email to in-person visits. All of our documents are stored electronically so we can work with clients wherever they are. How Much of My Time Will My Cycling Accident Case Take? Not typically. I understand the importance of your time. You hire me so I can take care of your claim while you recover and go on about your life. We will meet for an initial interview and then, typically, communicate by phone or email regardless of how close or far away you are to our office. I will need your hands-on participation if your case goes to trial.